"It's a healthy wrap using hummus as the dressing, with oven-crisped prosciutto and vegetables." Arrange the prosciutto slices on the baking sheet so they don't touch, and bake them in the preheated oven until crisp, 6 to 8 minutes. Remove from the oven, and let cool. Stack the tortillas on a plate and microwave them on High until warmed and pliable, 20 to 30 seconds. 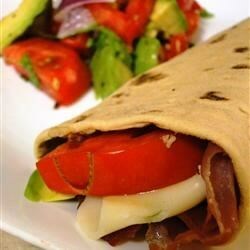 Spread each tortilla with 2 tablespoons of hummus spread, and top each with 3 slices of crisped prosciutto per wrap. Place a slice of mozzarella cheese on top of the prosciutto, and spread 1/4 of the avocado slices per wrap on the cheese. Top each wrap with 1 sliced tomato and about 1/4 cup of torn lettuce leaves. Fold the bottom of each tortilla up about 2 inches to enclose the filling, and roll the wrap tightly into a compact cylinder. What a healthy and filling sandwich. You could also use roast beef or even turkey or ham for the meat. I would also use fresh spinach instead of lettuce for the added health beneifts. store bought regular hummus and preshuto made it way to saulty. I only had one it had good potential. I love this wrap. When it's hot, I fry the meat on the stove top and melt the cheese by placing a lid over the pan. I also like to add sun-dried tomatoes, if I have them. Delicious combination of flavors! Made the recipe as written - doubled the recipe and enjoyed the wraps for lunch the second day. Thanks for a great recipe!